A few Formula 1 drivers may well be able to say that their other car is a Bugatti Chiron. Today through, we’re reversing that, as this single-seat open-wheel racing car is constructed purely from the pieces around within LEGO’s flagship 42083 Technic Bugatti Chiron set. Designed by Technic legend and TLCB Master MOCer Paul Boratko aka Crowkillers, this brilliant Bugatti B-Model includes a four-speed paddle-shift gearbox with a reverse and neutral switch, working steering and suspension, and a V10 engine. Paul calls his B-Model a Formula 1 car, but we’re more in the mind of an Indycar or Formula-E racer, what with the Bugatti’s large wheels and the swoopy bodywork, although that enormous V10 is most unlike Formula-E (and even Formula 1 these days). Whatever it is it’s a fine B-Model that’s well worth a closer look, especially if you’re lucky enough to own a 42083 Chiron set yourself. Head to Eurobricks by clicking here to see more images and a video of the model’s features. Suggested by a reader via our Facebook page this is Crowkillers’ latest supercar, the somewhat oddly-named ‘Alucard GT’. Constructed entirely from unmodified LEGO pieces Crowkiller’s newest creation is packed with working functions, including an eight-speed working paddle-shift gearbox, complete with a D-N-R rotary dial. That amazing transmission is hooked up to a detailed V8 engine up front which drives all four wheels (or the other way around seeing as this is an unpowered LEGO Technic model), there’s all-wheel independent suspension, working steering, and gull-wing doors too. 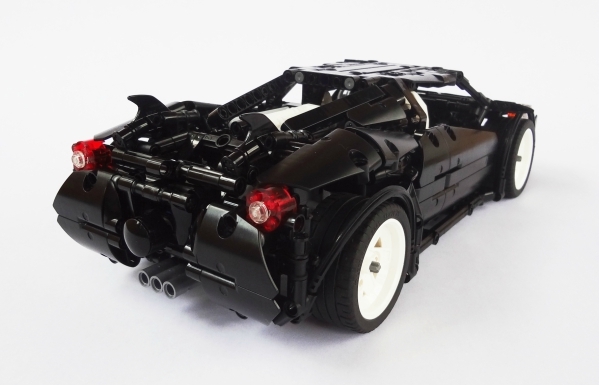 There’s much more to see of Crowkillers’ latest Technic Supercar via the Bricksafe gallery and you can watch a video of the model’s features by clicking here. *Today’s slightly obscure title track. And you thought we weren’t cultured. It’s an orange Smartie for you guys! Suggested by a reader, much to the annoyance of the Elves, TLCB Master MOCer Paul Boratko aka Crowkillers is back with another amazing Technic supercar. Entitled ‘Constrictor’, Crowkillers’ latest build wraps a V10 engine, independent suspension, working steering with Ackerman geometry and 4-speed transmission in a stunning orange body. See those features in action and read more about the build via the Eurobricks forum – Click here to take a look. *’One-Eyed Python’ and ‘Trouser Snake’ versions also available. This fantastic looking Technic Supercar ‘Outlaw’ comes from TLCB Master MOCer and serial bloggee Paul Boratko, better known as Crowkillers. His latest creation celebrates 40 years of LEGO Technic, and returns the theme to its mechanical roots. Paul’s model forgoes Power Functions motors and remote control for gears and levers, and we love it for that. Working steering, all-wheel suspension, a deployable rear wing, 4+R gearbox and a V8 engine are all included, and all must be powered manually by the human (or Elf) in control. There’s more to see of Paul’s build, including detailed images of the chassis, gearbox and suspension, on MOCpages – click the link above to make the jump to the full gallery and build specs. We’re not really sure why you always get an orange at the bottom of your Christmas stocking. This TLCB writer usually gives his to the Elves, who – having been caged over Christmas – are usually pretty hungry and devour the fruit – skin, pith and all. Technic car building legend and TLCB Master MOCer Paul Boratko (aka Crowkillers) has returned with his Christmas orange, and it’s far more exciting than a loose piece of citrusy fruit. Even if you’re an Elf. Featuring a 4-speed sequential gearbox, working steering, a mid-mounted V8 engine, all-wheel drive and all-wheel suspension, Crowkiller’s ‘Scorpion’ is a proper mechanical Technic supercar, and we love it. 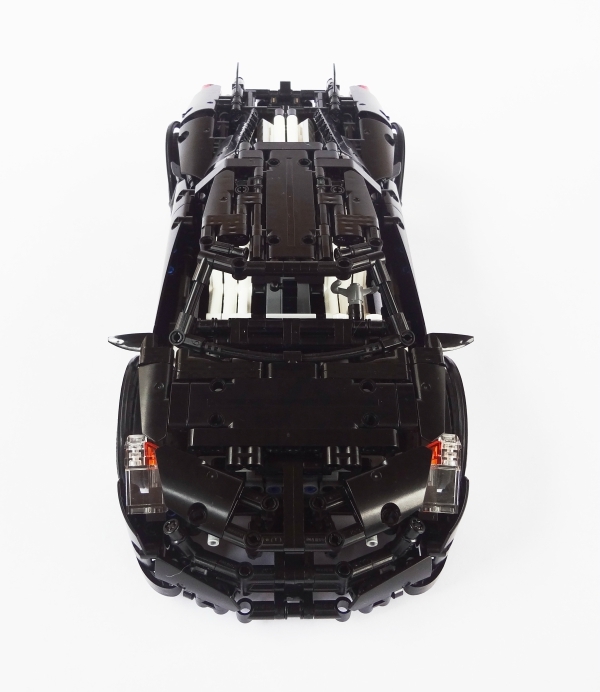 There’s a huge gallery of the build available to view on Brickshelf, which includes detailed chassis imagery as well as further photos of the complete car. Click the link above to start peeling! We round off a busy day here at TLCB Towers with this, Crowkillers‘ stunning new supercar. Built from the pieces of the 42056 Porsche 911 GT3 RS Technic set, Crowkillers’ latest creation goes back to the roots of the Technic Supercar franchise, without Power Functions, pneumatics, or a limited edition book. Instead Crowkillers has focussed on mechanical functionality, and in doing so he’s created a wonderfully functional model. Suspension is independent on all wheels with an in-board pushrod set-up, there’s a mid-mounted V8 engine connected to a sequential 4-speed gearbox driving all four wheels, plus working steering, opening doors, engine cover and luggage space. There’s more to see of Crowkillers’ ‘Scorpion’ Supercar via his Brickshelf gallery and the Eurobricks discussion forum, plus you can read our interview with Crowkillers as part of the Master MOCers series by clicking here. The Lego Car Blog favourite Crowkillers is back, and this time he’s not working alone – but he hasn’t teamed up with another builder as you might expect. Instead Crowkillers has collaborated with the legendary Count’s Kustoms hot rod shop from the History Channel’s ‘Counting Cars’ TV show in order to create a pair of unique creations. Above viewers of the show will recognise Count’s 1956 Chevrolet truck, complete with custom flame decals, whilst below is a model that some of our readers may recognise from a previous post. Based on his ‘Assassin’ Technic Supercar, Crowkiller’s latest creation has been custom-painted by Count’s Kustoms’ own Ryan Evans and you can own it! This amazing one-off Technic Supercar is being auctioned for charity to raise money for a little boy with acute lymphoblastic leukaemia, and it also includes two customised mini-figures from the TV show. You can read more about the model via Eurobricks, and if you’d like to see more of this unique collaboration and bid for your chance to own it you can do so by clicking on the giant letters below. Our set review of LEGO’s 1980 Technic 8860 Car Chassis is one of the site’s most popular pages of all time. And for good reason. 8860 is the genesis of Technic Supercars and took the whole concept of large LEGO sets in an entirely new (and brilliant) direction, without which we probably wouldn’t have 2016’s Technic Porsche 911 GT3. OK, perhaps that’s not a great example, but we’d certainly miss 8880, 8448 and many of the sets that followed. Just thinking about 8860 gets much of TLCB office so wistful and nostalgic it’s like mentioning food rationing to your grandparents. Paul Boratko (aka Crowkillers) hasn’t helped productivity here today then with his wonderful modern interpretation of LEGO’s 1980 icon. Built using the latest studless Technic parts Paul’s 8860 redux is instantly recognisable, yet upgrades the venerable old set in every key area. Working steering, all-wheel suspension, adjustable seats, and a functioning gearbox hooked up to a flat-6 engine all feature, alongside modern tyres and LEGO’s latest parts designs. It’s a creation that’s well worth further investigation, and you can do so at Paul’s MOCpage or via the Eurobricks discussion forum here. You can also read our interview with Paul in Master MOCers Series 1 here, and you can check out our review of the original 8860 Technic set from 1980 via the Set Review Library. Paul Boratko aka Crowkillers is back at TLCB, thanks to an eagle-eyed reader. This is his latest creation, and you might have noticed that it’s quite a lot smaller than his previous builds. However, somewhat remarkably Paul has still squeezed in a range of Technic Supercar functions, including working steering, opening hood, engine cover and butterfly doors, and a mid-mounted miniature V12 piston engine. There’s lots more to see via Paul’s MOCpages account, and you can check out our interview with him via the Master MOCers interview page here. It’s Easter, and this is about as close as our Elves are going to get to anything seasonally appropriate. It’s only one letter away anyway. It is of course a ‘Funny Car’ – in effect a dragster chassis with a silhouette car body added atop it. This one comes from Technic legend and TLCB Master MOCer Crowkillers, and it’s got working steering, a blown V8 and the Funny Car necessity of hinged bodywork. Suggested to us by a reader, you can see more at Crowkillers’ Brickshelf page – click the link above hit the drag strip. TLCB opens the batting in 2016 with a suggestion from one of our readers. Found on his Facebook page, Crowkillers has returned with a tribute to the late George Barris, one of the greatest custom car designers of all time, who sadly passed away in November of last year. Barris was a pioneer of the hot rod scene and created some of television’s most famous and outlandish vehicles, including the Munster Koach, and the Batmobile. Crowkillers’ Technic homage is nearly as crazy as George’s best works, and features two supercharged V8 engines, a four-speed gearbox, working steering and suspension, a deployable wheelie-bar, and opening scissor doors. You can see all the images of Crowkillers’ latest build on Brickshelf, and you can read our interview with him in the Master MOCers Series by clicking here. The Elves are riotously excited following this find. They love Technic Supercars, and TLCB Master MOCer Paul Boratko (aka Crowkillers) is one of the very finest supercar builders around. His latest creation goes one step further to pleasing the Elves, as alongside the usual (and impeccably engineered) Technic Supercar features, Paul has added a few optional extras. Violent optional extras at that, including wing-door mounted missiles, machine guns in the front wings, and the power of flight thanks to some nifty transformation. You can see more images and read the full specification details on Eurobricks, MOCpages or Brickshelf, plus you can see Paul’s ‘Shuriken’ Supercar in action in the video below, with a very Elf-friendly soundtrack. Thank you to all the readers who suggested this creation to us. You can view all the photos of the new Supercar on Brickshelf, all of Crowkillers’ previous vehicles on his website, and you can read our interview with the man himself here. Welcome to The Lego Car Blog’s new series! Today marks the start of our collaboration with one of the top Lego Vehicle groups on Flickr, the superb Head Turnerz. Head Turnerz’ members have supplied our Elves with a wealth of blog-worthy vehicles since the group’s inception in late 2013. We’ve decided to extend the mini-figure grab-hand of partnership to the group administrators in order to bring you the Top 5 creations in a variety of categories over the coming months. Jorgeopesi’s Pagani Huayra is not just as visually stunning as the real thing, but with a working 7-speed manual gearbox, remote controlled drive, and a huge list of other amazing features, this Pagani is our favourite Technic Supercar ever. Congratulations to Jorgeopesi, and you can click here to see more of the world’s current best Technic Supercar. The incredible Crowkillers takes a close second place with his amazing 997 Porsche GT3. Porsche’s 911 is very difficult to replicate in Lego, but Crowkillers has built the most accurate 911 we have ever seen – and it’s not just the body that’s accurate, there’s even a working 6-speed transmission hooked-up to the famous flat-6 engine. To see more details of this supercar make sure you visit Crowkiller’s brilliant website, you can even buy the instructions so that you can build it yourself! Dirk Klijn’s McLaren MP4-12C has a 3+Reverse gearbox and is one of the most visually appealing Technic Supercars on the web. But that’s not all. It’s also fully modular – meaning that the body can be completely separated from the chassis and each component removed, replaced and upgraded with ease – exactly how LEGO themselves design their products. To see the full gallery of number three in our list click here to visit Flickr. It wouldn’t be a Technic Supercar Top 5 without one of Sheepo‘s incredible models, and what’s better than a Volkswagen Beetle?! Sheepo’s VW Bug is not your typical ‘supercar’, but it is a technical masterpiece featuring everything that a real Beetle does, and it’s exceptionally detailed inside and out. Sheepo’s brilliant bug can be found on Flickr here, plus on his own website via www.sheepo.es. Sariel’s incredible Enzo Ferrari comes in at number 5 with beautiful body lines and more functions than you can believe! With full independent suspension, a manual 4-speed gearbox, V12 piston engine, pneumatically opened doors, moving accelerator pedal, electrically adjustable seats, automated rear wing and much more, the only way to see it all is to take a visit to Sariel’s excellent website. There you have it; the Top 5 Technic Supercars ever! Do you agree with the Head Turnerz choices, or has someone been missed who really should have made it onto this list? And is the Top 5 simply too red? Let us know your thoughts in the comments or via the Feedback page, and you can let the Head Turnerz administrators know your opinion on their Top 5 by joining the discussion at the Head Turnerz Group – just click the link above to join. We’ll see you soon for our next Top 5. Watch this space! Master MOCer Paul Boratko (aka Crowkillers) is back! The latest in his long line of exceptional supercars is ‘Phantasm’, a mid-engined, two seat sports car featuring a huge range of Technic functions. Under the rear deck sits a V8 engine driving the rear wheels through a working gearbox, with steering, independent suspension and butterfly doors all appearing too. Paul’s newest masterpiece will appear on both Brickshelf and his own website shortly, but you can get an early look at the Phantasm via the Eurobricks forum; click the link above to join the discussion! You can also read Paul’s Master MOCer interview with TLCB by clicking here, or by visiting the Interviews page in the main menu.